In the DTU Magazine DYNAMO November 2008 issue no. 15 the theme is Life Sciences. The magazine has an article (in danish) about a mobile application enabling efficient remote treatment of ulcer patients. As a result of the mobile application the number of amputations dropped by almost a quarter, treatment is better and faster, and the local authorities are saving money. The initial mobile application prototype was developed by a student at DTU Informatics during a course in mobile application development. 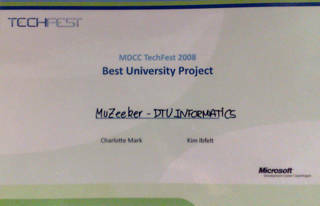 At the TechFest 2008 at Microsoft Developer Center Copenhagen, my colleague Michael Kai Petersen and I won an award in the category “Best University Project” with the MuZeeker mobile application. DTU Avisen no.7 2008 has an article (Section 1, p.14 and Section 2, p.2) about this amazing mobile application, which was done by Mads Vium Asbjørn. He was a student at DTU and implemented the application for the company Dansk Telemedicin while carrying out projects on mobile application development in my course at DTU Informatics. Mads did his master’s thesis project on Secure integration of mobile phones and payment cards with focus on VoIP in milab. Gør din festival virtuel med mobilen! At the S60 Summit in Barcelona we presented the MuZeeker Widget (for the S60 platform). 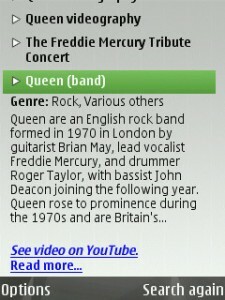 All About Symbian have an article and a Podcast about ‘The wonderful (widgetised) world of Web Run-Time (WRT)’ that both mention our MuZeeker Widget. More information about the Muzeeker Search Engine and Widget is available here.